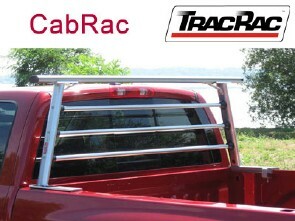 CabRac™ a cab protection headache rack for pickup trucks. 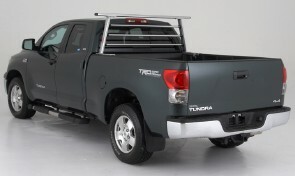 Unique 3 bar window guards with integrated accessory tracks give you the protection from bed cargo. Aerodynamic, low profile crossbars enable access to garages or low ceiling areas and eliminate wind noise. A no drill, damage free mount system, long lasting dual powder coated aluminum construction and broad truck fits mean that this may be the last headache rack you'll ever buy.